Vermont Mutual Insurance Group is committed to helping our communities and we are especially pleased to support the Vermont Foodbank. The Vermont Foodbank serves 153,000 Vermonters (25% of Vermont’s population) by distributing 10 million pounds of food to families in need. 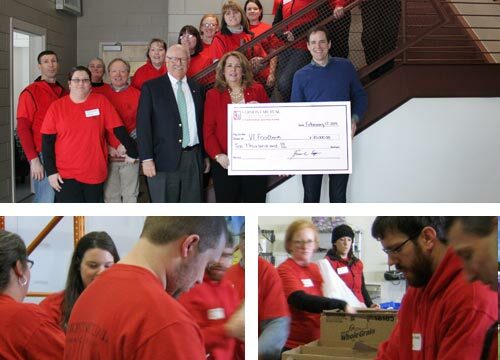 Vermont Mutual assists the Foodbank’s efforts with financial support through our Charitable Giving Fund and employee volunteer efforts. In 2015 we were able to present the Vermont Foodbank with a $10,000 gift from our Charitable Giving Fund. And with the help of Vermont Mutual volunteers, we devoted extra time helping to prepare care packages for Vermont children and families.